"The light-house lamps a few feet distant shone full into my chamber, and made it as bright as day, so I knew exactly how the Highland Light bore all that night, and I was in no danger of being wrecked...I thought as I lay there, half awake and half asleep...how many sleepless eyes from far out on the Ocean stream — mariners of all nations spinning their yarns through the various watches of the night — were directed toward my couch," Cape Cod, reflections on lodging at Highland Lighthouse, July 1855. Visit the Sandwich Historical Society & Glass Museum. Visit the Highland Lighthouse Museum. 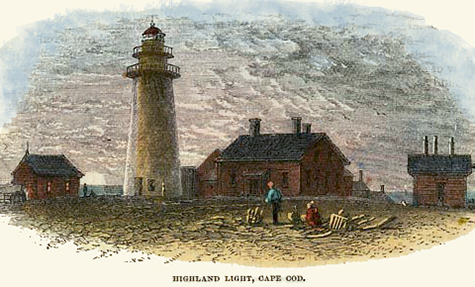 Thoreau's Cape Cod includes a chapter on Highland Light in Truro that he crafted from his research into its construction and operation during his visits here between 1849 and 1857. While his commentary on the lighthouse drew from various books and articles, as well as anecdotes he heard from local residents, he also made use of his expertise as a surveyor to measure the height of the building and calculate the rate of beach erosion to determine when the structure might have to be moved or replaced. Like the other chapters of Cape Cod, "Highland Light" integrated Thoreau's direct observations with information culled from an array of sources in history, geology, topography, botany, and other fields. For instance, as he traveled by train, or "the cars," as he put it, then by stagecoach as he and his companion, Ellery Channing, made their way to Truro, he consulted the eighth volume of the Massachusetts Historical Collections, which he had brought along from Concord to aid his study of the towns along his route. 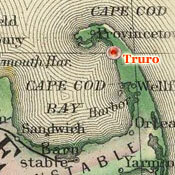 Likewise, in line with his lifelong interest in cartography, he referenced A Map Of The Extremity Of Cape Cod Including the Townships of Provincetown & Truro, which had become the authoritative chart of the region after it was published in 1836 under the supervision of Maj. J.D. Graham, a talented topographical engineer working under a commission from Congress. Rather than quoting or referencing such works to lend authority to his text, Thoreau generally used them as sounding boards to amplify his own experience. 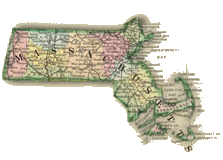 In this respect, Cape Cod hearkens back to his early essays, especially "The Natural History of Massachusetts," a wide-ranging book review that appeared in The Dial in 1842. The review addressed, as he indicated in a footnote to the title, Reports — on the Fishes, Reptiles, and Birds; the Herbaceous Plants and Quadrupeds; the Insects Injurious to Vegetation; and the Invertebrate Animals of Massachusetts. Having obtained these reports at the Statehouse, Emerson carried them back to Concord with the express purpose of setting Thoreau "on the good track of giving an account of them in the Dial." 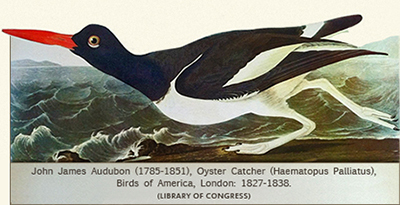 "Books of natural history make the most cheerful winter reading. 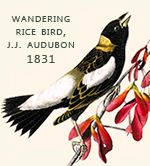 I read in Audubon with a thrill of delight, when the snow covers the ground, of the magnolia, and the Florida keys, and their warm sea-breezes; of the fence-rail, and the cotton-tree, and the migrations of the rice-bird; of the breaking up of winter in Labrador, and the melting of the snow on the forks of the Missouri; and owe an accession of health to these reminiscences of luxuriant nature." Cape Cod was clearly designed to perform a similar service, that is, not intended, in the manner of other travel books, to guide anyone along the same path, but to be itself an invigorating interior journey. And for all of its references to Humboldt, Darwin, and others whom the nineteenth century described as "men of science," it was not a collection of empirical observations about the plants, birds, people, or any other natural phenomenon he encountered on his way, but was instead a literary performance. "Those who have read 'Margaret Smith's Journal,' will be at no loss in settling the authorship of this clever and interesting work. Mr. Whittier touches all his themes with the true poet's wand...It is just the book to read in the idleness of summer, when wishing to enjoy the pleasures of journeying, without the inconvenience which the actual packing up and going off in hot steamboats and dusty cars occasion. Read it, and see," September, 1849. 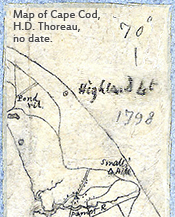 Study one of the maps that Thoreau used on his excursions to Cape Cod. 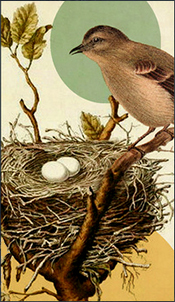 Listen to a mockingbird sing in Truro. Read David Porter Heap, Ancient & Modern Lighthouses (Boston: Tichnor, 1888). 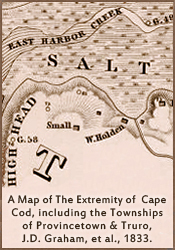 Visit our maps section to learn more about Thoreau's cartographical approach to Cape Cod.